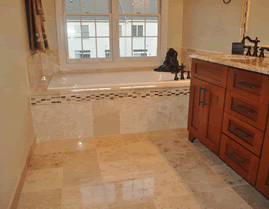 Bathroom remodeling is a popular renovation project for homeowners in the Alexandria, VA and Fairfax, VA areas. A new bathroom enhances the décor of the home, improves functionality, and most of the cost of construction can be recouped in added value. ABC Design & Build provides bathroom remodeling for projects of all sizes in Northern Virginia and Washington DC. Currently, open and spacious bathrooms are a popular selling feature for home buyers and among the most cost effective remodeling projects for adding value to your home. A substantial portion of every day is spent in the bathroom, so make it more functional and enjoyable with bathroom remodeling from ABC Design & Build. We will work with you to create a customized plan for a bathroom that suits your needs. Bathroom remodeling can address a range of problems with your existing space. Older homes may lack sufficient lighting, places to store bathroom items, and have small, cramped spaces that don’t work well in modern life. There are options for adding storage, improving lighting, increasing the number of electrical outlets, increasing the size of the bathroom, fixtures, showers, tubs, and more. We will guide you through the choices to design the perfect space for you. If you are considering one renovation project to improve the value and appeal of your home, bathroom renovation is a great choice. Please browse our website to read more about our company and remodeling services in Alexandria, VA, Fairfax, VA, and surrounding communities. Contact us to discuss your project and request a free estimate for your new bathroom.